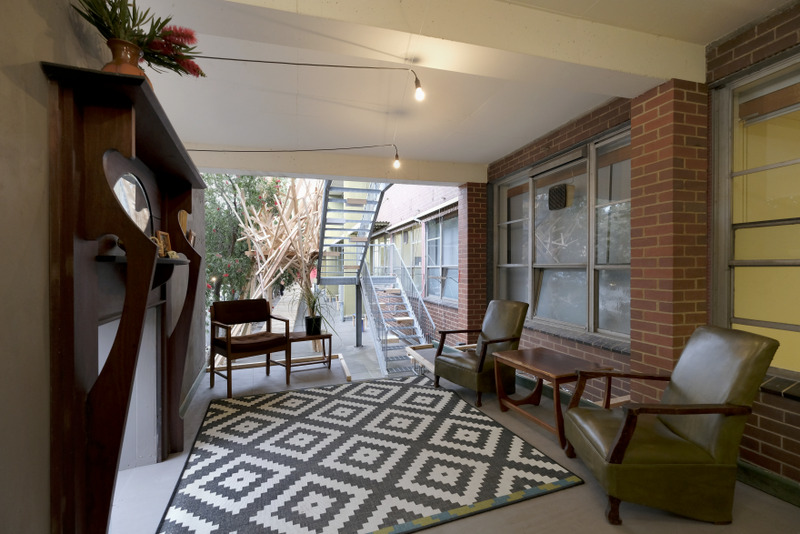 How can the practice of Interior Design be applied to open up the contemporary neo-liberal city and make space for asylum-seekers, refugees and other socially marginalised migrant communities? The Guesthouse Project focused on this question and investigated how the relational priorities, strategies and approaches of the interior designer could be applied to design and construct a temporary urban space that instigated positive encounters with 'otherness' and invited participants into events of cross-cultural sharing and exchange. The project was conducted in 2016, in Melbourne, Australia. 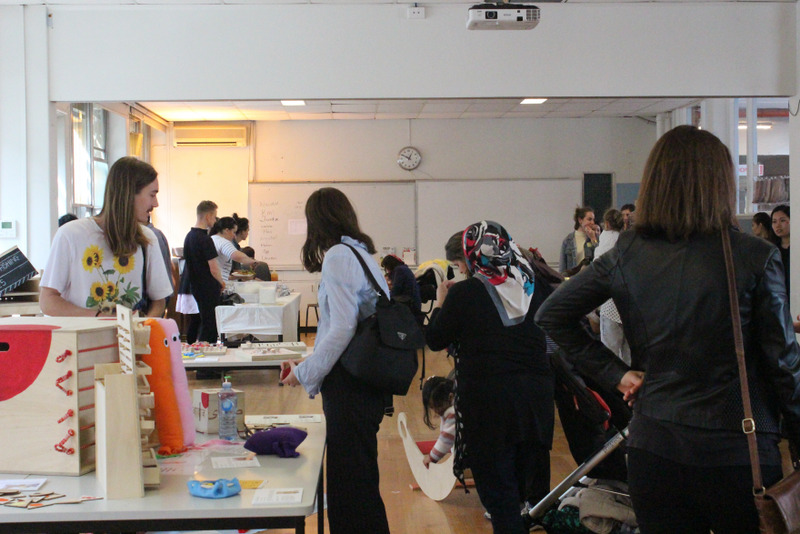 It was a joint venture between the local migrant community, interior design students from RMIT University's School of Architecture and Design, Berlin-based architecture collective raumlabor.berlin, and local refugee services organisation VICSEG, with Dr. Caroline Vains as project leader. 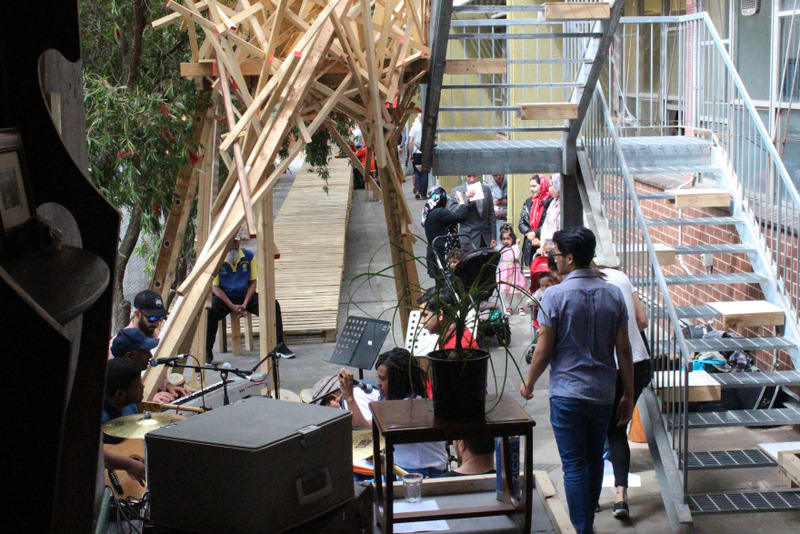 It was a practice-led investigation into how design might be leveraged to generate social cohesion at the local scale. It culminated in two primary design outcomes. The first of these was a suite of full-scale pop-up structures that experimentally adapted the traditional guesthouse (both spatially and as place of welcome) to reflect a new context; that of refugees, asylum seekers and other recent arrivals. 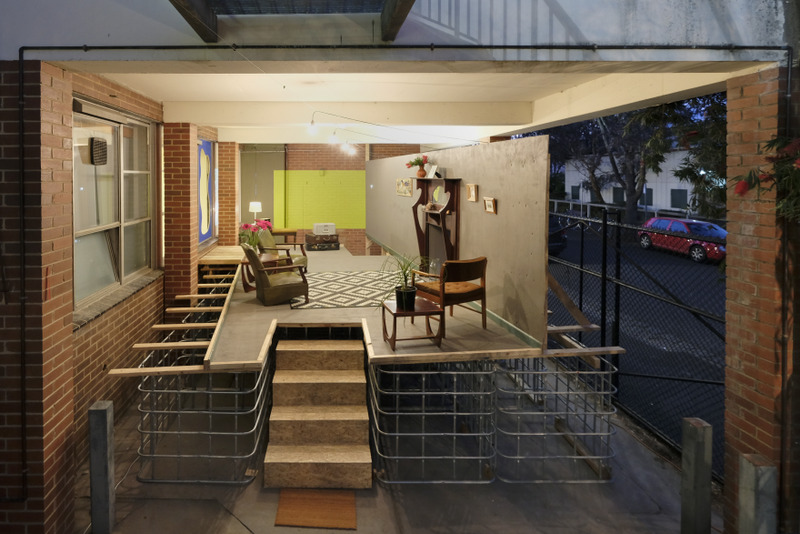 These structure were designed and constructed on the grounds of an old primary school in Melbourne's inner city and in accord with sustainable building practices. Collectively they spanned 30 metres long and 7 metres wide, and over the course of the weeks hosted two key events during which members of the wider community were invited to occupy the structure and use it as a platform to celebrate diversity through music, food and conversation. 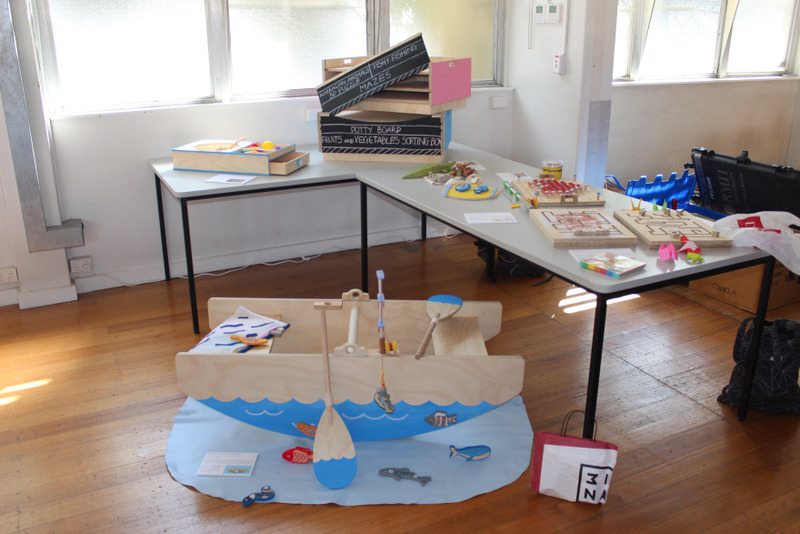 The second design outcome was a collection of play equipment and toys for children in local refugee playgroups to use. Each piece was intended to be interpretive, process-based, age-appropriate, culturally nuanced and adaptive, and designed to inspire wonder and delight. Collectively they were curated as an interactive exhibition for the final Guesthouse event, the multicultural Family Day and Community Party, and, as such, provided a strong thematic focal point for it. 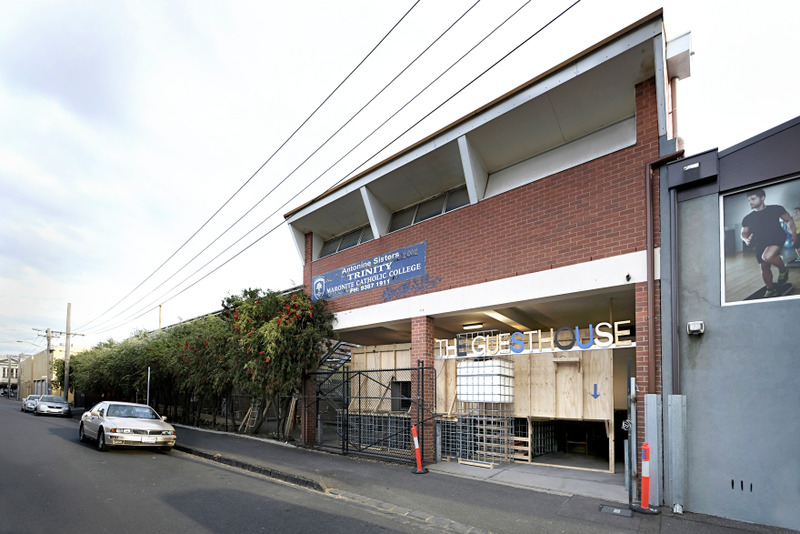 At the conclusion of the Guesthouse Project, the structures were dismantled, recycled and/or gifted. 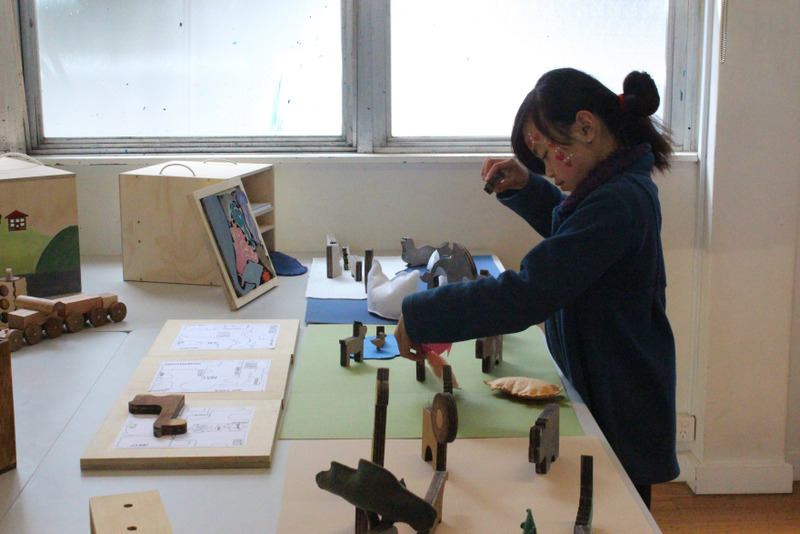 While the play equipment was gifted to the refugee women and children involved in their design development. There were six main structures that comprised The Guesthouse: 1) the inside-out lounge room, 2) the treehouse-hideout, 3) the long walk-ramped bridge, 4) the back-yard fire, 5) the stepped platform and window of the bar, 6) the person-hole and bridge between inside and outside. The first four were situated outside the school building and ran in the narrow strip of landalongside its rear wall. The last two were designed to rupture this wall and bridge outside and inside. Activities for the public events could accordingly be programmed both outside the building amongst the pop-ups, and inside the building in the adjacent run of old classrooms. Sustainability: The Guesthouse project was commited to using sustainable materials and construction practices. All materials sourced were recycled with the suppliers taking them back after use. The design also incorporated principles of pre-cycling i.e. using materials without damaging them so they can be used again. Furniture and 'set dressing' was found on the street and upcycled or borrowed from the local pub. Family day and community party: For the multicultural family day and community party we invited a 10 piece band from the Asylum Seekers Resource centre to play. African food was prepared by a social enterprise refugee training program called Social Studio. Cross-cultural exchanges were facilitated by students who ran a series of workshops and activities (signing the set with finger prints, face painting, pet rocks, dance and origami groups etc.). Local migrant community leaders attended and used their bi-lingual and social mediation skills to facilitate cross-cultural exchanges. Many migrant families approached me and others involved in the organising to thank us for hosting the event and the parent recipients of the toys expressed how moved they were by the gifts. Socio-political value of the temporary design intervention: There are many questions surrounding the ongoing impact of the temporary social design intervention. In this instance, however, the success of the temporary Guesthouse intervention led to an invitation to Government House by the Governor of Victoria, the honourable Linda Dessau AO, to discuss a similar but permanent project for the grounds of Government House. For this new project, Dr. Vains will again lead a group of RMIT Interior Design students to design a series of pavilions, shade arbours, an outdoor kitchen, entrance and seating around the newly planted kitchen garden to the rear of Government House. The intention is to give the garden a human-scale in its larger landscape context, to infuse it with a sense of place, and transform it into a suitable space for hosting the Kitchen Garden program. The primary aim of the program is to bring migrant and refugee women together to grow, cook, and share food. The program will also reach out to include members of the wider community and, in doing so, assist all participants to foster cross-cultural connections, understanding and learning. The project is currently underway and being coordinated by Government House as a cross-institutional design competition.